Today I did some research for Annabelle Heath, which was mainly stunt driver for Diana Rigg in six months and finally figured out what was Avengers season which the actress has participated. Many Thanks for the result are to Dave Rogers. When I re-read the book The Ultimate Avengers, I thought for the first time, is it possible that Annabella Wise, that Dave mentioned in the book as an understudy Diana Rigg in the episode Who's Who?? ?, and Annabelle Heath are same face? I went to the family trees and the answer was found quickly. Annabelle Covey (surname at birth) married to a man by surname Wise in December 1960. From March 1969, her second husband was someone by surname Heath. So, though now we knows, dear Avengers fans, that Annabelle was stuntwoman for Diana Rigg in period of colour era, there are two possible options for her time period: first - production block from Autumn 1966 to April 1967, and second - first quarter to Summer 1967. Oh, at the time I still make a stop at the episode What the Butler Saw, but soon I will delve in color era. Good work. The Ultimate Avengers is the only Dave Rogers books I haven't. The Ultimate Avengers is a book with some rare information details. I often use it and Mike Richardson's book when working with the episodes for the website. 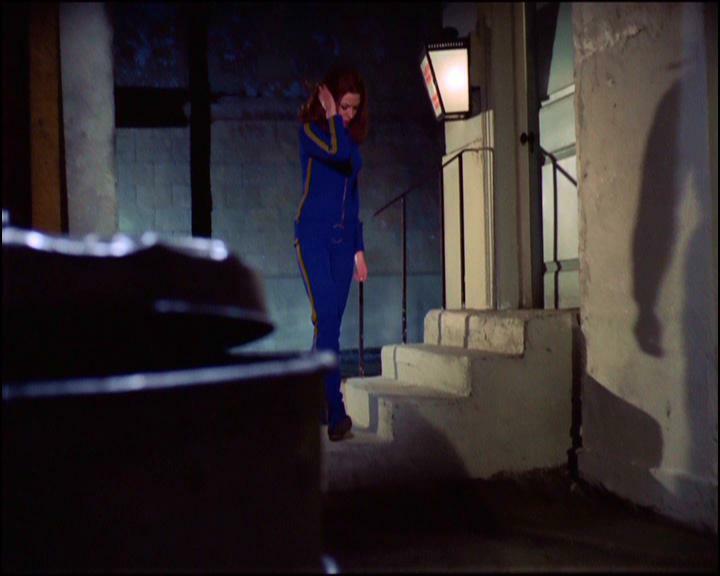 Hmm, it may very well be that the girl in the image below is Annabelle Heath, stunt driver of Diana Rigg in season five (as a double for Diana Rigg came out of Lotus or passed by Lotus in the previous shot of episode). I checked by DVD Optimum all the moments in the episode The Correct Way to Kill where Diana Rigg was replaced by a double and I did not find Cyd Child. P.S./ Moreover, I could not identify any of the doubles in episode, at all (yes, including Rocky Taylor - I caught a couple of frames where the actor who understudied Patrick's fencing is standing in profile - he does not look like Rocky Taylor for me). I was hoping Bob Anderson or John Greenwood was included as stuntman in episode, but no. Hmm, a lot of unknown persons (like the citizens in the episode The Living Dead). Annabelle Heath for 'normal' scenes, Cyd Child for 'action' scenes but Diana Rigg is there as well, isn't she ?